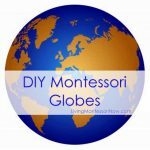 Previous article: 4th Blogiversary Giveaway – $1,023 Montessori Print Shop/Montessori at Home Products!!! Today’s activity has sentimental value for me. My husband and I were given the Easter tree from my mother-in-law years ago when our kids were little. 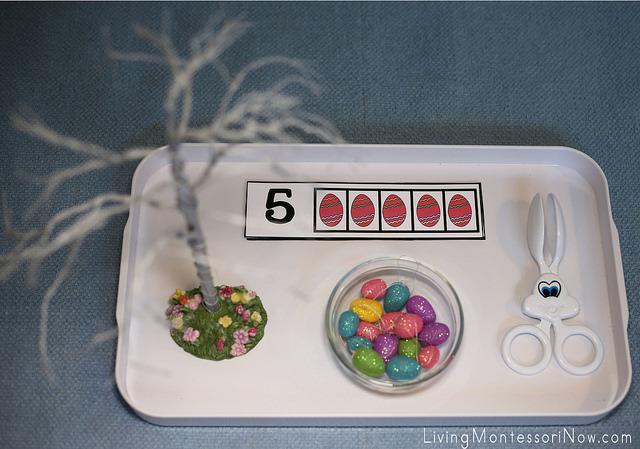 I’ve saved it through a number of moves, and I’ve used it here to create a Montessori-inspired Easter activity for preschoolers. 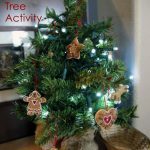 Decorating an Easter tree can be a popular practical life activity similar to a Montessori Christmas tree activity. I’ve added some additional steps today to work on extra skills along with the decorating-a-tree activity. You can purchase an Easter tree from a craft store or on Amazon, or you can easily make one using a branch you find on a nature hike. I found the small Easter egg ornaments at Michaels craft store. I also found the bunny egg tongs at Michaels. The bunny tongs aren’t essential, but they’re fun and add an additional practical life activity. 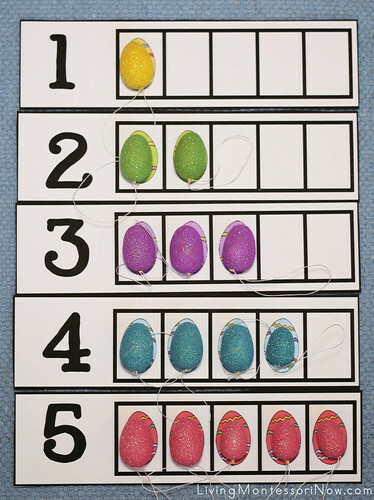 For the activity, I used a free printable, Easter egg counting mats 1-5, from Pink Polka Dots & Pre-K. 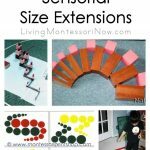 I used a large plastic tray and rug from Montessori Services. I would have the child use the bunny tongs to pick up the eggs from the bowl and lay them out on the rug. The tongs are great practice using the grip and movement the child needs for cutting with a scissors. Then I would lay out the number strips in the proper order. I’d recommend the child just use fingers to sort the eggs by color from the rug to the number strips. 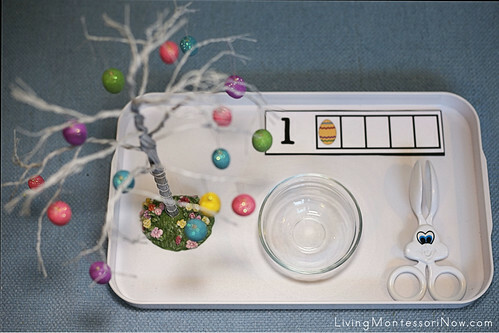 When the eggs are sorted by color onto the number strips, I’d have the child place the eggs onto the tree one color at a time. If you tell the child that it’s best to space out the eggs from the same color, you’ll help the child learn a skill that will be useful when decorating Christmas trees (or any trees) in the future. 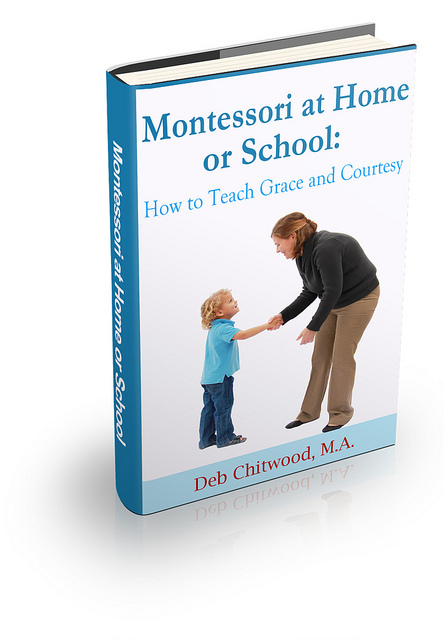 Although children in Montessori education put away their work before placing it back on the shelf, this is an activity that’s nice to be admired as a decoration. You could allow children to leave the tree decorated at the end. The tray would still need to be returned to the shelf, but it would include the decorated tree. 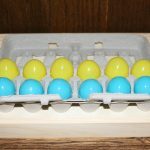 When another child chooses to do the activity, he or she could remove the Easter eggs from the tree and place them in the glass bowl at the beginning of the activity … before going through each of the other steps. Have you had an Easter tree decorating activity in your home or classroom? 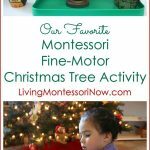 Don’t miss my AMAZING 4th Blogiversary Giveaway with $1,023 worth of Montessori Print Shop/Montessori at Home Products! Open worldwide! Ends 4/12/14 at 9pm PST. 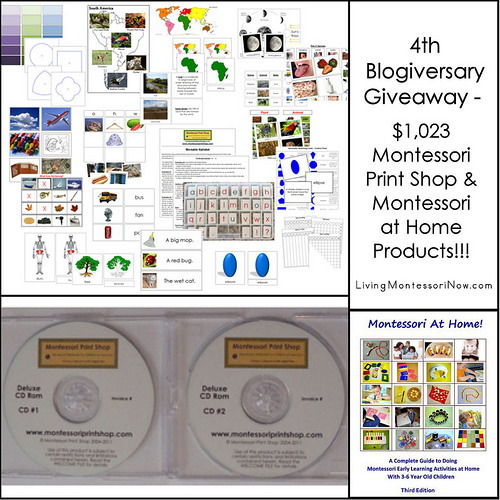 Previous Post: « 4th Blogiversary Giveaway – $1,023 Montessori Print Shop/Montessori at Home Products!!! I love this idea- I’m sure my son would love it. In any case, we are making that tree! What a cute counting task. I love it! Thank you for sharing at Sharing Saturday! Just what a cute counting task. I like it! Appreciate talking about at Talking about Saturday!